Can A Candidate Pay Delegates? Plus, 3 Possible GOP Convention Scenarios Rides on Air Force One and state dinners were lures the last time there was an open convention. What about cold, hard cash? Top Republican lawyer Ben Ginsberg explains what's permissible and not. 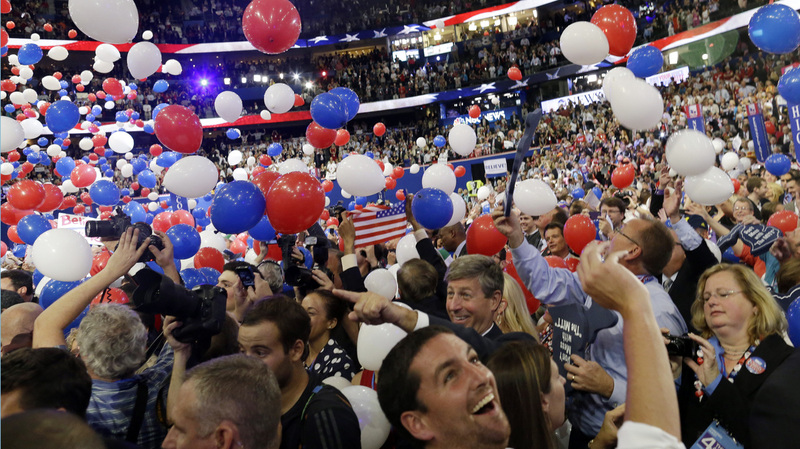 Balloons fall at the 2012 Republican National Convention in Tampa, Fla. This year's convention in Cleveland is likely to be far more complicated. The last time there was a contested convention, when the nominee wasn't known going into the convention, was 40 years ago. Back then, incumbent President Gerald Ford led Ronald Reagan, but he didn't quite have a majority. That changed before the first ballot at the convention. How? Rides on Air Force One, state dinners, and ... persuasion. "The Mississippi delegation was unbound and was persuaded of Gerald Ford's credentials, [and] threw its weight for Gerald Ford," Republican election lawyer Ben Ginsberg said in an NPR Politics Podcast Monday. "I believe there were rides provided on Air Force One. ... It's legal," Ginsberg pointed out. "I believe that wavering delegates were invited to state dinners. I believe that there were conversations between Ford aides and delegates about the virtues of Gerald Ford, and that's certainly legal." This year, with Ted Cruz's wins in Wisconsin last week and Colorado this past weekend, a multiballot convention is looking increasingly possible, if not likely. So what could be offered this time around? "I think state dinners are kind of off the table for the Republican candidates this time, which is too bad," Ginsberg noted, "but travel would not be improper [to places like Donald Trump's Mar-a-Lago resort in Florida] under any existing rules. Things like travel and meals and subsistence and expenses are all perfectly legal." "My legal advice would be that might smell like a bribe to somebody," Ginsberg said, "and so probably not a good idea. And I don't think anyone would contemplate the actual payment of dollars. There is a statute that prohibits the offer of a federal job, but telling somebody that, 'Gee, you look like a really accomplished individual, and we want you to be a part of what we get going forward once we're elected' is certainly permissible as a thing to talk about." 1. The Clear Winner: "I would put more money on that than anything else. We are Republicans; we like things neat and tidy. ...By history, you would think that somebody does get to the magic 1,237 number, in which case, you have a clear winner and a peaceful convention." 2. The Clear Cluster: "That's the situation where no candidate is within proximity to getting the majority. So, if 1,237 is the magic number, it's somewhere around 1,100 delegates that someone comes in with. That's a situation where there will be all sorts of disagreements and discussions over the rules, so that one candidate or another stands a better chance under the rules. It is difficult in that scenario, where the camps get locked in, to see somebody actually succeeding in getting to 1,237, except after a long period of time, but that's kind of a fair fight. But multiple ballots." 3. The Party Buster: "If you're going to have a 'clear cluster,' you've got to have a 'party buster,' too. So, the 'party buster' is when a candidate is within close proximity to the majority, but doesn't have it, and if that candidate — Donald Trump seems the most likely under the current delegate totals — comes into the convention with 1,200 delegates and needs 1,237 and somehow is denied that 1,200, that's the most contentious scenario."